Some people have watched the film Bully and come out of it with inspirations -- ideas about how to end this sort of horrible mistreatment of kids by other kids in American schools. Some have seen it and gone through tissues by the box and have left screenings with temporary feelings of sympathy -- or maybe even of empathy. Others, like yours truly, walked out of it in an existential tailspin. It is a documentary that chronicles the bullying of a few young people in a few towns. There is no narrator. What we get is a series of clips, images and statements by the people involved: parents who have lost children to suicide; parents who have children who are being bullied and the children themselves, who, for whatever reason, are being tortured by their classmates. You know what I saw? First, I saw stupid adults who are the maintainers of a system that encourages kids to categorize one another and whose actions in response to bullying were so moronic that it was all I could do to keep from clawing the cushioning off of the sides of my seat. Second, I saw kids behaving in a way that causes me to question the very worth of mankind. I watched a principal chastise a kid who was being tortured by another. The bullied kid didn't want to "shake hands" with his tormentor (of course, the bully was all too eager to "make up" in front of the principal). The vice principal told the bullied boy: "You're just as bad as he is." This same professional educator told the parents of a bullied kid that when she, herself, rode the bus on which bullying was taking place, the kids were "good as gold." (Thought bubble above moronic principal's head: Kids are bad. I ride bus. Kids are good. Therefore, problem solved.) These are some of the people to whom we are entrusting our kids. It was difficult to watch clips of young Alex being poked with pencils, grabbed around the neck, punched, ridiculed and threatened with knifings and death. What was tougher was to watch a bus full of kids either join in or sit still and watch all of this happen. Alex's parents? What did they have to offer? Criticism of Alex. The father pulled the old "stand up for yourself" bit and then he sweetened the pot by pointing out that if Alex didn't do something about it now, his little sister might also wind up being bullied when she got to the middle school. (I'm not making this up.) Then, the mother basically chastised her son because kids are supposed to bring parents joy not...this. Brilliant parenting. When she asked him to share his feelings, he said, "I don't think I feel anything anymore." Don't know what happened after that. She probably sent him to his room so she would have time to lament her personal misfortune in private. 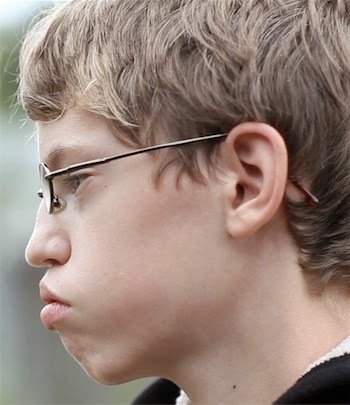 No one, not the parents nor the educational professionals seemed the slightest bit concerned that Alex was, most likely, a case of Asperger syndrome who should have been getting the special education help he needed. One child of parents in the film had committed suicide. His best friend was interviewed. The surviving friend talked of how the two of them used to play for hours in their secret hideout in the woods -- they'd talk for five hours at a time and spend time "hunting rabbits." Yet, the boy had killed himself. Why? Why did he think that one good friend was not enough? Why did a close family and one good friend not override his feeling of being an outsider elsewhere? I'll tell you why: us. We love wise quotations like "he who has many friends has none" but we walk a different walk. We encourage all sorts of wonderful behaviors that we not only forget to model for our kids but that we present the polar opposite of. We're a hypocritical society that wants to believe that the cruelty of children is just phase; that it is something that a new "program" can fix. Yeah -- let's make yet another organization to battle this. Far too much work to raise good kids who wouldn't participate in the humiliation and torture of their fellow humans. But is there any solution for parents who don't have an inkling of what to teach their kids? Worst of all: we are a society of joiners. We teach our kids to sign up; to participate; to become a member of a team. We teach them that they are weak on their own and strong in numbers. We show them that to be alone is to be lonely; to do one's own thing is to be weird. Case in point: "Be a leader, not a follower." This is kind of like putting out two shirts that you want your toddler to wear to school so that he feels as if he has a choice, isn't it? What if I don't want to be a leader but I still choose not to follow? There are a whole lot of other options in there, but kids can't see them unless we shine a light. But we don't, so they don't. Community: great for keeping us alive, healthy and "provided for" but not so great for everything else. Maybe society is the real bully. It is extraordinary how often school authorities totally miss who is doing the bullying and who is ending up ostracised. On a positive note, I heard on the radio that there is a new long-term programme, which started in Canada and has been very successful wherever it's gone - it's starting in all schools in Scotland now apparently - which teaches kids about empathy, and the teacher is a baby! The baby comes in, with its parent, obviously, once a month and the children somehow talk about all sorts of things via interacting with the baby and supposedly it makes a quantifiable difference, (no, I don't know how they measure the difference, but it sounded interesting). That does sound interesting. Probably more for little kids? We did an exercise, as a faculty, before watching the film. We posted lists of our student population (some 400 kids) and teachers and administrators all got a different color marker pen. We were all to go around and put a dot next to kids we "had some connection with" and the results were powerful. Somewhere around ten of our students did not have one dot. The questions then become: Why not? How do those students stand with their peers? What will we do to get to know them better? It certainly sheds a light on the issue, if nothing else.